Perfect for someone who wants to finish, stain or paint a custom game. A lively and challenging party game! If you need a fun outdoor game for summer fun, this is it. Players test their stacking skills by removing and replacing blocks from the nearly 3-foot-high tower to make it taller without knocking it over. Customize the 72-block set by painting the blocks or decorating them with words and phrases – get as crazy as you want. 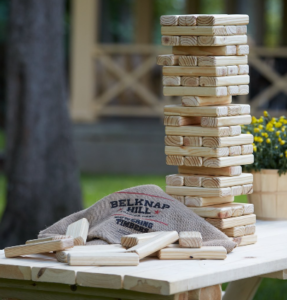 Towering Timbers is the perfect life sized Jenga set for parties, wedding receptions, tailgating and other events that call for easy but exciting games. The game’s storage box has a handle for convenient transport. Individual blocks measure 2-1/2 x 1-3/16 x 7-1/4 inches. Made of solid, unfinished wood in the USA. Because the wood is unfinished, the blocks are not waterproof. If blocks will be left outside, we recommend that you apply a waterproof finish. Towering Timbers is trademarked by Belknap Hill Trading Post. Fun oversized stacking tower party game with 72 blocks. This is a well made set that is smooth to the touch. The down side is that it doesn’t come with a carry bag and that is the reason for the loss of stars. You can however make a box easly.